Well, well, well, look who accidently...but really not so accidentally....didn't blog for the entire summer. But it's ok because fall baking is about 6 million times better than summer baking anyways so it looks like I picked the perfect time to pop back in....with an apple cake! covered in caramel! and cinnamon buttercream! But first, let me catch you up on my summer. I was pale as a ghost, I almost got tan, and now I'm very pale again. And that about sums it up. But really, it was a great summer, full of things like family vacation where I skied until my arms fell off, my first triathlon, my sister getting engaged (!!!!) (maid of honor/cupcake wedding cake baker reporting for duty! ), camping trips with the boyfraand and of course lots and lots of time spent at the bakery. Summer is always great but as soon as it's over I am full fall all the time. 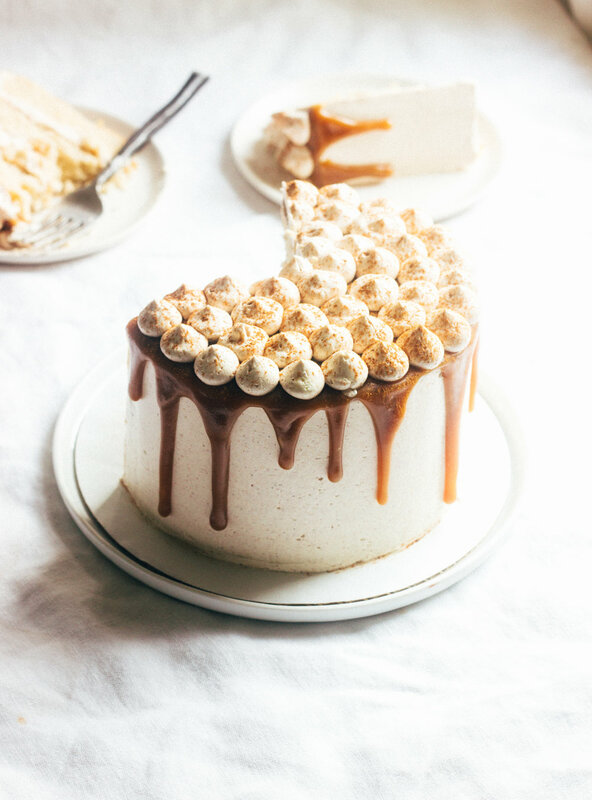 And what better way to get v. v. fally than with a caramel apple layer cake. The cake is a spiced butter cake with sauteed apples folded into the batter before baking. It's adapted from my baking magazine obsession Bake From Scratch and as soon as I saw an apple cake in this season's issue I knew I needed it in my life pronto. There's 2 cups of diced apples in the batter which seems like a lot, and it is, but after I baked them I almost wished I had done 3. So if apple cakes that are more-apple-less-cake are your thing, I would maybe go for the 3 cups. The cinnamon buttercream is a basic swiss meringue buttercream mixed with cinnamon and vanilla. So simple but so perfect. And then the whole thing gets all drizzzzed up with a brown sugar caramel sauce. You could also put some of the caramel sauce between the layers if you want even more caramel apple action, but I would recommend putting it on the cake before the buttercream so it can soak into the layers a little, rather than on top of the buttercream which might cause the layers to slide around a bit. A great tutorial for the drip cake of your dreams can be found here. In a saucepan, melt 2 tbsp. butter. Add the apples and saute over medium heat until softened, 8-10 minutes. Remove from heat and let cool slightly. Preheat oven to 350. Line cake pans with parchment paper and spray well with cooking spray. In the bowl of a stand mixer, fitted with the paddle, beat butter and sugars for 4 minutes, scraping the bowl halfway through. Add the eggs one at a time, scraping well and beating after each addition. Sift the flour, baking powder, salt and spices into a separate bowl. Add the dry mixture to the butter mixture in three additions, alternating with the milk and mixing until just combined after each addition. Beat in the vanilla. Add the cooked apples and gently fold into the batter. Divide the batter between prepared pans and bake until a tester inserted in the center comes out clean. Start with 25 minutes if you are using 6 inch pans and increase from there. Let cool in pans for 10-15 minutes before removing to a wire rack to finish cooling. For the frosting, combine egg whites and sugar in the bowl of a stand mixer. Place the bowl over a pot of simmering water and whisk until the sugar is melted and the mixture is very warm to the touch, about 160 degrees. Return the bowl to the stand mixer fitted with the whisk attachment and whip the egg whites until they form stiff peaks. Swap the whisk for the paddle and run the mixer on low. Add the room temperature butter a few tbsp. at a time until fully incorporated. Increase the mixer speed to medium-high and beat until the frosting comes together and is silky smooth. Add the vanilla and cinnamon and mix to combine. Finally, reduce the mixer speed to low to beat out any air bubbles. For the caramel drizzle, melt butter in a medium saucepan. Stir in the brown sugar and corn syrup and increase the heat to high. Bring the mixture to a boil and cook, stirring often, until the sugar dissolves and the mixture is no longer grainy, about 5 minutes. Reduce the heat to low and carefully whisk in the cream. Continue to simmer for 8 minutes, stirring often. It will thicken slightly as it cooks, but mostly as it cools. Remove the pan from the heat and stir in the vanilla. Transfer to a separate container to cool and thicken. To assemble the cake, trim and level your cake layers. Fill and frost with the cinnamon buttercream. Once you have a smooth, final coat on the outside, place the cake in the freezer for 15 minutes. Once the cake is chilled and the frosting is firm, pour the caramel glaze on top a little at a time. Use a small offset spatula to ease it towards and over the edges of the cake to create drips. Pipe remaining buttercream on top and chill until the caramel sets up. Serve and store cake at room temperature.